As Project Support Officer for the ‘Unlocking the Asylum’ project, a large part of my work involves the listing and repackaging of approximately 23,000 patient files. These files begin in 1948 (when the NHS was formed), up to the closure of the North Wales Hospital in 1995. Before a patient file is repackaged, all metal fastenings (treasury tags, pins, staples, paper clips, rubber bands etc.) are removed, and replaced with brass paper clips and plastic treasury tags. Metal fastenings can cause irreversible damage to the files, their removal will prevent future damage. Each file is kept in its original order, however depending on the length of stay and treatment a patient received, a file can be as small as one piece of paper, to a file that can fill 2 boxes. Each individual file is repackaged in archival folders, tied and safely stored in archival boxes. Information extracted from the files are listed on a database, detailing the patient number, patient name, date of birth, admission and discharge/death date. The diagnosis (if given) is also listed, along with any additional details such as treatment given, outpatient information, psychiatric social work notes, number of admissions, referral information, notes/poetry/sketches made by the patient and psychiatric reports for court proceedings. As the development of medicine progresses quickly during the mid-20th century, there is reference to a wide range of treatments within the files; for instance Insulin Coma treatment, Electro Convulsive Therapy, Leucotomy, Malarial treatment, Aversion therapy, Psychotherapy, and the use of early Anti-depressants such as Largactil and Tofranil are all well documented. The first Annual Reports of the hospital (1850-1860), list only five ‘forms of disease in all cases admitted’- mania, epilepsy, dementia, melancholia and idiot. In comparison, the database (so far) has over 800 different diagnoses, ranging from acute alcoholism to Wernicke’s encephalopathy. Long term patients’ diagnosis’s also evolved, one example is of a patient admitted in 1949 with Manic depressive psychosis, who was discharged from the hospital 45 years later in 1994, with a diagnosis of Bipolar disorder. The most common and most frequent treatment used during the 1950s to the 1970s, was ECT (Electroconvulsive therapy), however its reputation made many people consider it more of a punishment than a treatment. Despite this, it is evident from listing the patient files, that ECT was still used at the hospital up until its closure in 1995. ECT is in fact a therapy that is still used today, psychiatrists and patients still consider it to be a safe and effective treatment for severe depression and bipolar disorder. Current practice, known as modified ECT, uses muscle relaxants to avoid the physical dangers of a seizure and anaesthesia to avoid pain from the electricity. As a result of the Abortion Act of 1968, there is a marked increase of patient files containing referral for psychiatric assessment in the late 60’s early 70’s. It was now possible to obtain an abortion under the NHS if a psychiatrist was prepared to sign a recommendation that proceeding with the pregnancy could damage the patient’s mental health. In addition during this time, Psychiatrists were required to produce reports for the justice system, with needs to respond to probation officers and legal officers in providing evidence for court reports. However psychiatric reports were not only needed for criminal cases, but also for divorce proceedings, Court of Protection applications and claims for industrial injury and road collisions, as the compensation industry was established and was rapidly expanding. Of the 22,800 files listed 8,015 were outpatients or referred to outpatients upon their discharge from the hospital. The work of the outpatient clinics expanded rapidly in the immediate post war years, in 1947 the medical superintendent said he regarded the outpatient clinics as the most fundamental service provided by the hospital. By the end of the 1950’s the hospital ran outpatient sessions in Rhyl, Bangor, Wrexham and Dolgellau. Several of the files include notes by the psychiatric social worker, who supported the outpatient clinics by spending time investigating the home environment of patients. The social worker evidently had a valuable role to play in the after care of the patient, ensuring a smooth re-entrance into family, occupational and community life. Very notably during the late 70’s into the early 80’s that there is a sharp spike in those admitted for drug addiction and alcoholism. The admission of a growing number of patients with drug related problems had implications on hospital management. The needs of these patients were very different, some of them, usually quite young, could be disruptive, particularly to the already established routines on the wards. By the late 80’s so high was the demand for rehabilitation, the hospital had its own drug and alcohol unit for treatment and recovery of patients diagnosed with addiction. These files clearly contain a wealth of information, and there is so much more to be discovered in relation to medical advances and social trends in the mid to late 20th century. Please note that due to NHS regulations records of patients containing sensitive personal information are closed to the public for 100 years. These records may be available to researchers who belong to an academic institution upon request. If you are interested in using the North Wales Hospital collection for academic research please contact us. The first weekend in September sees the return of the Corwen Walking Festival. This popular event provides walkers with the opportunity to explore the southern end of the Clwydian Range and Dee Valley Area of Outstanding Natural Beauty. There are walks planned around the town, along the River Dee and up to the highest points of the Berwyn Range. There is also an opportunity to improve your navigation skills, with the inclusion of a ‘Map and Compass Skills and Basic Navigation’ lecture on the Saturday evening. Denbighshire is well blessed with areas that are perfect for walking. In addition to the Clwydian Range and Dee Valley there is also the Clocaenog Forest, and the Denbigh Moors. 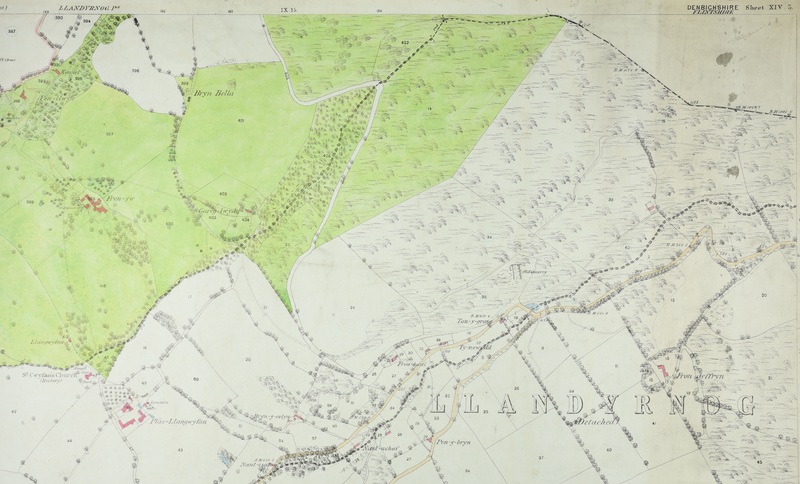 For those who like to get out into the wilder parts of the county you may be interested to know that Denbighshire Archives holds many items which could enrich your walking experience. Our historic maps of the county are particularly useful as they provide you with a window into the past. This can give you the opportunity to see if a particular place or feature of the landscape existed at a particular date, and allows you to contrast the modern landscape with how it once looked. The oldest series of maps held at Denbighshire Archives are the Tithe Maps, which represent one of the first large-scale, systematic mapping surveys of England and Wales. They were produced between 1838 and 1850 as a direct result of the Tithe Commutation Act of 1836, which replaced the ancient system of payment of tithes in produce with monetary payments. 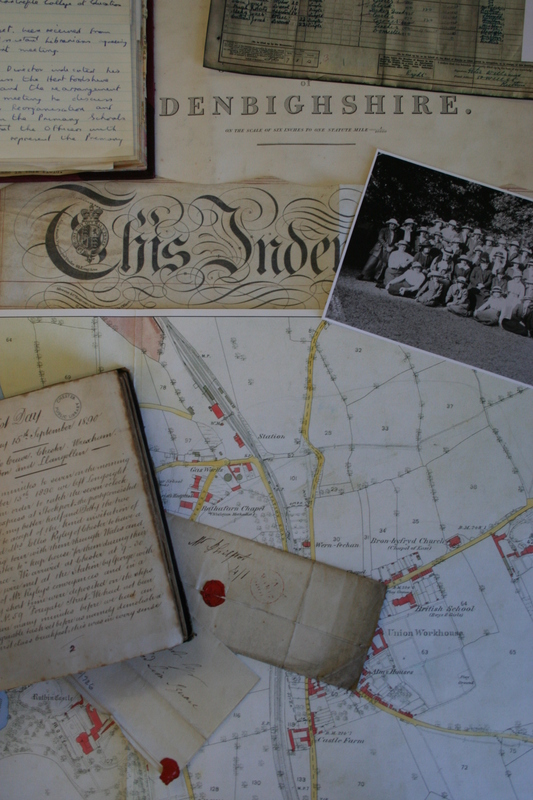 In conjunction with the apportionment, which is the written accompaniment to the map, they contain an abundance of detail as they hold details relating to the land owner, tenants, property or field names, acreage of land and land use. Each map is divided by parish. Ordnance Survey Maps have become the trusted companion for outdoor enthusiasts in this country. Here at the archive we hold the first 3 editions of the County Series, which were produced between the late 1870s, and the 1920s. These are available on request in the search room. There were two routes that passed through Denbighshire. One route to north was bound for Wrexham and Chester which passed through Ruthin, Llanarmon-yn-Ial, and Llandegla. The other route travelled through the south of the county, entering Corwen from Bala, going through the Berwyn Mountains en route to Llangollen. 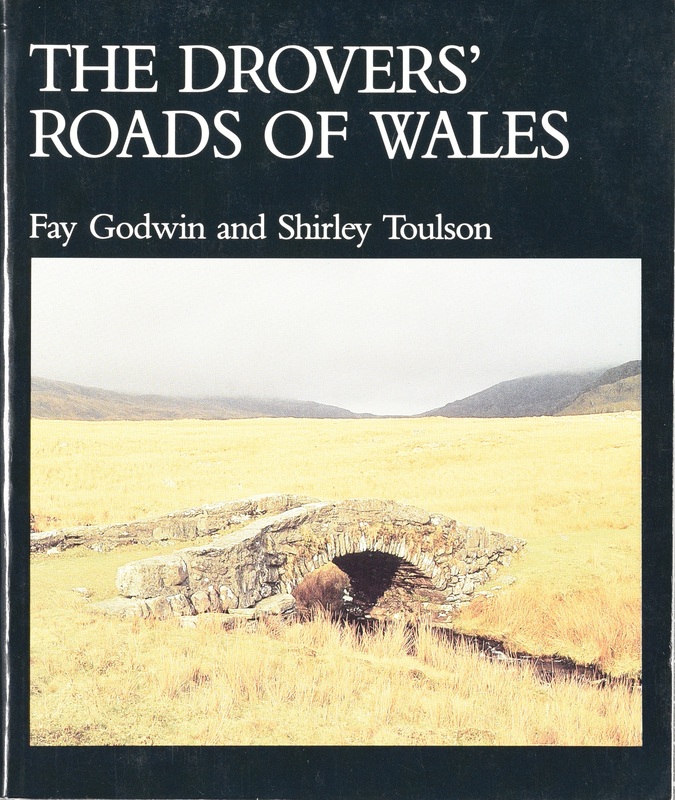 Shirley Toulson highlights the importance of Corwen to the Drovers, illustrating that this was the point where many of the northern droving routes converged as they headed east. The town was also strategically significant to the historic A5 London to Dublin coaching route, which passed through the town as it headed for Holyhead. Evidence of this can be seen in the various Trade Directories available in our search room. The records of Turnpike Roads (QSD/DT), contained within our Quarter Session records, show the development of this and many other roads.